English is the world language, except that most of the world doesn't speak it—only one in five people does. Dorren calculates that to speak fluently with half of the world's 7.4 billion people in their mother tongues, you would need to know no fewer than twenty languages. He sets out to explore these top twenty world languages, which range from the familiar (French, Spanish) to the surprising (Malay, Javanese, Bengali). 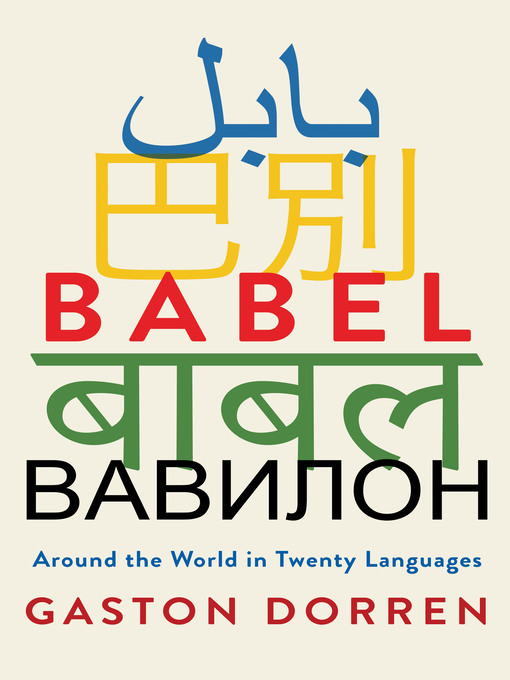 Babel whisks the reader on a delightful journey to every continent of the world, tracing how these world languages rose to greatness while others fell away and showing how speakers today handle the foibles of their mother tongues. Whether showcasing tongue-tying phonetics or elegant but complicated writing scripts, and mind-bending quirks of grammar, Babel vividly illustrates that mother tongues are like nations: each has its own customs and beliefs that seem as self-evident to those born into it as they are surprising to the outside world. Among many other things, Babel will teach you why modern Turks can't read books that are a mere 75 years old, what it means in practice for Russian and English to be relatives, and how Japanese developed separate "dialects" for men and women. Dorren lets you in on his personal trials and triumphs while studying Vietnamese in Hanoi, debunks ten widespread myths about Chinese characters, and discovers that Swahili became the lingua franca in a part of the world where people routinely speak three or more languages. Witty, fascinating and utterly compelling, Babel will change the way you look at and listen to the world and how it speaks.